If you have beach plans for Wednesday, you’ll at least want to keep an eye on the sky – and potentially stay out of the water. The National Weather Service is predicting a high risk of rip currents at local beaches Wednesday as seas reach 4-6 feet offshore. Making matters worse, thunderstorms – some with heavy downpours – are likely to move into the region during the day. The surf will also run at about 6-feet, with sound winds sustained at about 15 m.p.h. 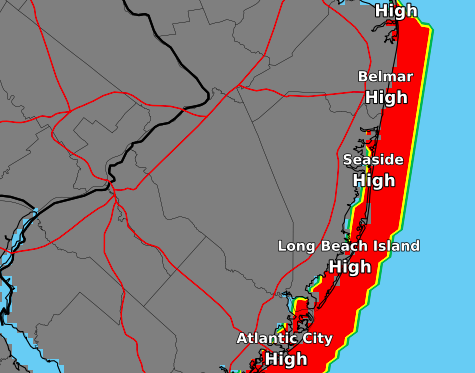 “People visiting the beaches should stay out of the high surf,” an NWS advisory said. The small craft advisory was set to remain in effect until 6 a.m. Thursday. As for the thunderstorm threat, precipitation will move into the region as a whole after 5 a.m. and will be scattered throughout the day, meaning there will be a constant threat of a storm passing through. There is an 80 percent chance of rain in Ocean County. The scattered storms will last through Wednesday night, giving way to fog after 3 a.m. Thursday. Clouds will continue into Thursday and the sun will re-emerge Friday, the forecast said.